This book outlines issues surrounding diversity among students, faculty, and staff and how one urban university library is working to embrace and celebrate the diversity found in its building, on campus, and in the local community. This book illustrates how universities are uniquely situated to engage students in discussions about diversity and how academic libraries in particular can facilitate and ease these discussions. A Diversity Council and the projects and programs it has developed have been instrumental in this work and may serve as an inspiration and launch pad for other libraries. 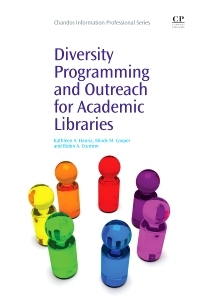 Diversity Programming and Outreach for Academic Libraries details anecdotal experiences, and provides practical suggestions for developing diversity programs and forming collaborations with other campus units, regardless of size, staff, or focus of the academic library. Kathleen A. Hanna is an Associate Librarian at Indiana University – Purdue University Indianapolis (IUPUI) and currently serves as the University Library’s liaison to the School of Physical Education and Tourism Management. She received a Bachelor of Arts in English from Purdue University and Masters of Information Science from Indiana University. Mindy M. Cooper is a Visiting Assistant Librarian at IUPUI University Library and serves as Reference Desk supervisor as well as liaison to the School of Journalism. She is currently chair of University Library’s Diversity Council and chair of the library’s Campus Outreach Group. Robin A. Crumrin is the Associate Dean of Collections and Information Access and Delivery at IUPUI University Library. She oversees four critical support teams: Access Services, Acquisitions, Bibliographic and Metadata Services, and Digital Libraries.